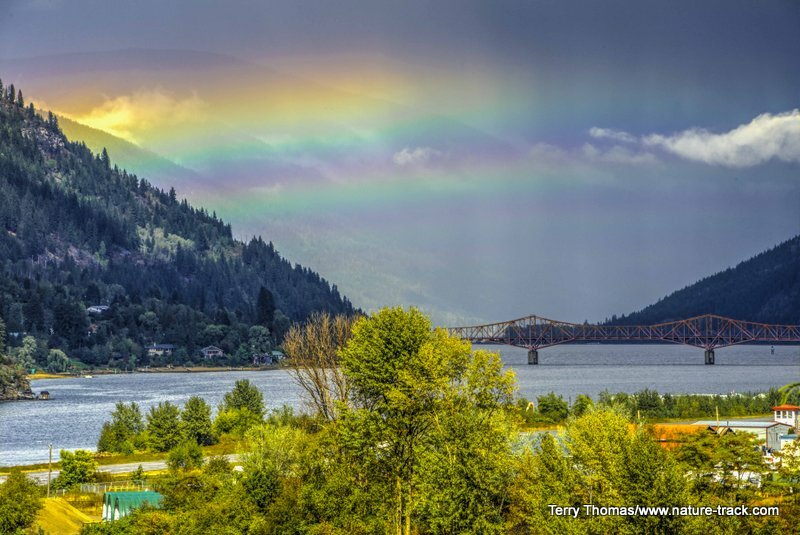 At Nelson, British Columbia, a recreation center of 10,000 less than two hours from the border, we caught a rainbow over what locals call BOB, Big Orange Bridge. When you mention British Columbia to most Idahoans, you may get either a blank stare or they will mention beautiful Victoria or Vancouver, British Columbia’s largest city, both a stone’s throw from Seattle. Since the province of British Columbia is about the size of Oregon, Idaho, Montana and half of Washington combined, that leaves a lot of country that most of us know little about and Idaho even shares a common border with British Columbia. That was certainly the case for us as we traveled up and across and then back across British Columbia via two different routes. We didn’t know what to expect, but we found out. As we traversed British Columbia from bottom to top, angling toward the western coast, we noted two things. First, British Columbia’s vast interior, while dotted with small towns, is relatively lightly populated. Most of the six million residents live in the south. Traffic on the roads was seldom busy and often we had the pavement to ourselves. This was especially true in the more northern areas. It was actually surprising to see how many people live in towns larger than Idaho Falls in the southern region though. We felt like geography dunces as we passed through Kelowna, a city we had never heard of with a population of over 100,000. These cities are built around a variety of industries from wine and fruit production, manufacturing and, as expected, timber and mining. Tourism seems to be a priority in British Columbia. With outstanding natural resources, there are four national parks along the Canadian Rockies—Kootenay, Yoho, Glacier and Banff, which it shares with Alberta. Jasper National Park is just across the provincial line in Alberta. In addition to the national parks, British Columbia has done a great job setting aside many other natural wonders in provincial and regional parks with associated campgrounds, visitor centers and trails. Everywhere we went from Watson Lake in the north to Nelson in the south, we were stunned by the incredible beauty and diversity of this place. Road signs warning of bear, elk, deer, moose, bighorn sheep, caribou, bison and even mountain goats crossing the road were everywhere, a reminder of just how wild this country is. We even saw a lynx from the road. Every mile and every corner provided stunning views, sometimes of wild country, other times of quaint pastoral scenes. I marveled and remarked time and again, that in over 3,000 miles, we didn’t see an ugly one. Most of the province seems to be forested in one way or another, ranging from temperate forests to coastal rainforests, aspens to Western red cedar. Around Kamloops are the lower elevation forests full of Ponderosa pine similar to what you might find on the Clearwater River of Idaho or around Missoula, Montana. At one campground we stayed at in that area there were even signs warning of rattlesnakes, something unheard of in most of BC. I know this sounds like a tourism brochure, but I have to admit that we found little to discourage us from visiting British Columbia again. Distance is the biggest drawback, but you can reach the southern end in about the same time it takes to drive from Idaho Falls to Las Vegas. If you are looking for someplace new to visit, you should consider our neighbors to the north. Not a bad idea, eh? When we traveled across the state in October, most of the vehicles we saw using the wildlife management areas did not have wildlife plates. C'mon folks, let's help Idaho's wildlife by proudly buying and displaying a wildlife license plate on each of our vehicles! See below for information on Idaho plates. Most states have wildlife plates so if you live outside Idaho, check with your state's wildlife department or vehicle licensing division for availability of state wildlife plates where you live. Idaho Wildlife license plates provide essential funding that benefits the great diversity of native plants and wildlife that are not hunted, fished or trapped—over 10,000 species or 98% of Idaho’s species diversity. Game species that share the same habitats (such as elk, deer, antelope, sage-grouse, salmon, trout) also benefit from these specialty plates. No state tax dollars are provided for wildlife diversity, conservation education and recreation programs. Neither are any revenues from the sale of hunting or fishing licenses spent on nongame species. Instead, these species depend on direct donations, federal grants, fundraising initiatives—and the Idaho Wildlife license plates. Both my vehicles have Bluebird Plates. I prefer the bluebird because the nongame program gets 70 percent of the money from bluebird plates, but only 60 percent of the money from elk and trout plates - 10 percent of the money from elk plates supports wildlife disease monitoring and testing programs (to benefit the livestock industry) and 10 percent from cutthroat plates supports non-motorized boat access. Incidentally, in 2014, the Idaho Legislature denied the Department of Fish and Game the ability to add new plates or even to change the name of the elk and cutthroat plates (very specific) to wildlife and fish plates, a move that would have allowed for changing images occasionally and generating more revenue. It would seem that they believe that we Idahoans don't want a well funded wildlife program. Go figure. That is embarrassing but actually a fairly typical response to my nature essays. Since The Best of Nature is created from the very best of 16 years of these nature essays published weekly in the Idaho Falls Post Register (online readership 70,000), it is a fine read. It covers a wide variety of topics including humorous glimpses of nature, philosophy, natural history, and conservation. Readers praise the style, breadth of subject matter and my ability to communicate complex and emotional topics in a relaxed and understandable manner. Everyone can find something to love in this book. From teenagers to octogenarians, from the coffee shop to the school room, these nature essays are widely read and enjoyed. Some of the essays here are my personal favorites, others seemed to strike a chord with readers. Most have an important message or lesson that will resonate with you. They are written with a goal to simultaneously entertain and educate about the wonderful workings of nature. Some will make you laugh out loud and others will bring a tear to the eye and warm your heart. "We enjoyed your column, Bloom Where Planted. Some of the best writing yet. The Post Register is fortunate to have your weekly columns." Lou Griffin.